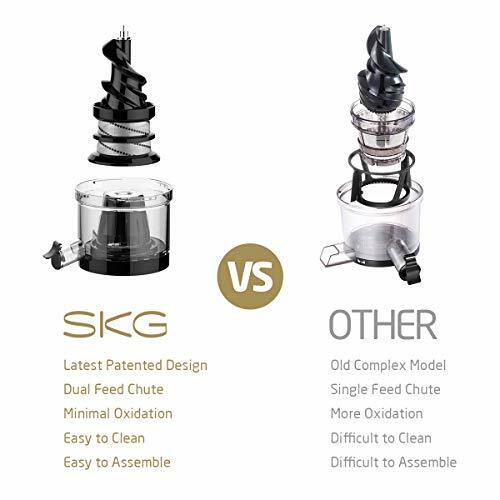 With different SKG juicer in the market, we choose to review SKG Cold Press Juicer High Yield Juice Extractor because it produces more juice than its competitor. It is so hard to resist for those who love to make their juice right in the comfort of their home. Package contains one SKG vertical cold press juicer motor base, one fine strainer, one rough filter, one pusher, one juicing screw, one strainer base, one compression silicone piece, one feeding chute, one final step strainer, one cleaning brush, one pulp jug, one juice jug and one manual. 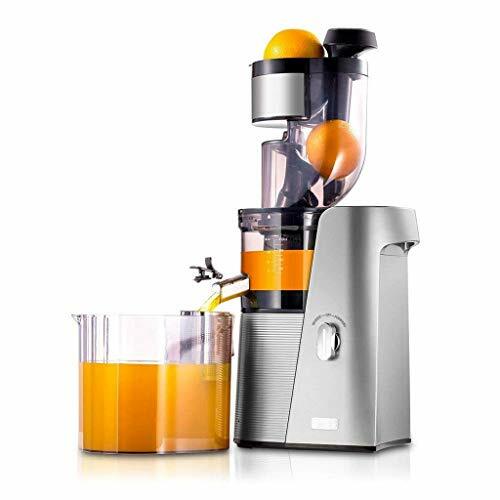 The juicer machine is made of quality Tritan food grade anti-oxidation materials. The setup of the juicer is immensely more comfortable to do for anyone without the assistance of anyone. It takes just a few simple steps to get the whole part setup. Setup is important to make the machine work. The juicer is a masticating type, and it works slowly to ensure that the juice is fully extracted. 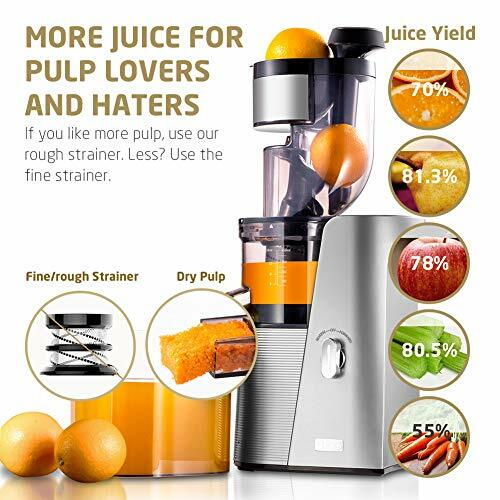 It doesn’t oxidize like the centrifugal juicer, and it is operated with powerful 250 W AC motor which means you have to find a closer power socket to power the juicer. The juicer can be used for different fruit such as orange, apple, pear, celery, and carrot. The juicer has a chute that is large enough to accommodate fruits and vegetables without you having to cut them into pieces. The juicer is much easier to use without the need for a pusher. Fruits will conveniently move through the masticator, and the juice will run out while the pulp as well will be ejected. For Vertical juicers with the big mouth like this juicers made people so easy to make high-quality juice. For slow juicers, the hard part is preparation time for cutting vegetables, and the time and energy to use pusher. After you must have fixed the whole part of the juicer and it’s ready for use, the very next thing to do is to insert the fruit inside the juicer through the opening of the lid on the tube. The juicer has to be running while you drop the juicer into the container. The masticator moving in the juicer will squeeze the fruit, and during the process, the pulp will get out through an opening into a container, and the juice will move out of the other opening, but you must have raised the cover on the opening to allow the juice get into the container. The juicer is very quiet, and you don’t have to worry about your household member. It isn’t the ideal juicer for those who love to have their juice on the go since it isn’t a centrifugal but a masticating juicer. The operation ensures that it doesn’t oxidize and that means you all the nutrients from the juice without leaving any out. To clean the juicer is very much more comfortable since it was so easier to assemble the juicer. It comes with the brush to make the cleaning easier to do for anyone. Its big in height, so keep in mind where you will keep this big juicer in your kitchen. All that you need to know about the SKG Cold Press Juicer High Yield Juice Extractor is all discussed in this post. It is one of the best you should consider if you choose to select any of SKG juicers in the market.